I think this is going to be my last opportunity to blog before Christmas. Thanks to everyone who has read, discussed, linked to, and commented on, my blog this year. I really appreciate your contributions. Hope you all have good Christmases. This could well be the last piece of 'Nativity News' for a while (although I will be interested to see how it performs over Christmas). Firstly, the film has now opened pretty much worldwide, and has had its second and third weekends on general release in the States. The news in terms of Box Office income is not good. Off the back of a fairly bad opening first weekend, it came in 8th for its second weekend, taking just $5.7 million (in the US) to bring it's total up to $15.9 million. Then this last weekend it took just $4.7 million. So it's total gross to date is $25.6 million with an added $6.1 million from worldwide sales(Box Office Mojo). This is still less than it's initial budget (given as $35 million, although some reports think it may be much higher once marketing and publicity are taken into account). I'm still hoping that word spreads and as Christmas draws near people will see it in greater numbers. The worry at this stage is that theatres will start dumping it before Christmas comes. Perhaps nostalgia and/or sentimental Christmas spirit will prevail. Whilst there are no major films still to be released before Christmas (Charlotte's Web and Rocky Balboa are small fry compared to previous years' offerings such as the Lord of the Rings trilogy Harry Potter and The Lion, the Witch and the Wardrobe), it's poor performance thus far might signal an untimely demise. If so, who should take the blame? Mike Rich, for writing a screenplay that lacks the controversy to create a media storm? New Line for going after those Passion dollars? Grace Hill Media, and the other publicity organisations for assuming that they could pull off the same stunts that worked for The Passion and get away with it? No doubt some Christian movie commentators will blame anti-Christian bias in the media, but at the end of the day it's the churches that have failed to come out in support so far. Phil Cooke summed it up nicely. I don't understand this at all. Christians complain that Hollywood isn't making good family films anymore - and we REALLY complain that they don't make films with Christian content, but when they do, we don't show up. As a side note we organised a screening of the film as a Christmas Event at our church. Our previous plans had to be cancelled at short notice, and our church is young and fairly media savvy, so we decided to go for it, and the event went very well. Lots of people turned up, and most that I've spoken to thought the film was good (most rated it more higly than I did). The problem though is typified by the fact that most of them hadn't heard of it until we told them about it, and few churches seem to be getting behind it in a similar way. I'm not saying that every church should do what we did - far from it - but it seems strange to me that so many churches embraced Gibson's gore-fest, but have ignored this one. Something, somewhere, doesn't seem right about that. Anyway, I've got a few more reviews to post. Having posted reviews from some of the more major media outlets last week, I'm going to look at more of the reviewers that I find interesting, so there are a few more biblical scholars here this time as well as a couple of other notables. First up there's Jeffrey Overstreet. Jeffrey was the person I learnt about this movie from, and his enthusiasm for Catherine Hardwicke's appointment stoked my own. He'd already posted his interview with Mike Rich, but whilst he found that "few (writers) have been as eloquent as Rich " he did think much of his movie. I think I agree with most of the problems Jeffrey finds in the film, but I don't think they bothered me as much as they did him, and I think I was more impressed by the positives. I'm pleased though that he's dared to question the quality of a film that is "faithful to scripture". A more positive review come from Nativity Story blogger Queen Spoo. Her blog has been an invaluable source of information over the last year, and it's nice to read a review by someone who knows her subject so well. She gives it a B+ and makes a couple of interesting observations such as linking the double quotation of 1 Kings 19:11-12 to the change in the wind that occurs at the Annunciation. Elsewhere biblical scholars Ben Witherington III and Scott McKnight have posted their reviews. McKnight's opening seems very positive, but then he seems to get somewhat distracted by the absence of the Magnificat. Witherington goes a step further and suggests the film will become a classic. He mentions one of the things I appreciated about the film, but haven't had time to comment on yet - the portrayal of Joseph as a teknis (craftsmen), rather than more specifically a carpenter. Whilst I'm on that aspect of the film, I liked how the film portrayed Joseph as being more affluent than Mary's family, and how that influenced her family's decision to marry her off for a much needed dowry. This harsh reality seems far removed from our society which is so affluent it is unthinkable of marrying for the money and not for love (apart from one or two famous names). Then we also have Mark Goodacre's review which has evolved from his few initial thoughts into its present format. He found a few historical anachronisms, and hated the angelic appearances, but was otherwise pretty impressed. No word yet from Tyler Williams, if he does post a review, I'll probably add it on here rather than start a new post. One thing I like to do at Christmas and Easter is have a look through the TV listings and see what programmes/films of interest will be showing over the festive period. I thought, then, that I'd post some of the highlights on terrestrial TV over here. Apologies to readers outside the UK, but I can't really work my way through the listings for every country. (I did note, however, that in the US Jesus of Nazareth is showing on the History Channel, as well as The Passion – Religion and the Movies). Documentary with Robert Beckford looking at the relationship between music and religion. I guess this is the music equivalent of The Passion: Films, Faith and Fury. Interestingly, that programme was originally scheduled for Christmas last year, but got moved to Easter as because that was a more religious time, which suggests something has changed at Channel 4. Documentary looking at the lost gospel of Judas, and trying to determine whether it is real or fake. The animated version of the film which I was obsessed by as a kid (having discovered it on holiday). It's not as flashy as the recent feature film, nor as faithful as the BBC TV version from the late 80s, but it still holds up quite well, although the US accents are a bit strange for a story set in 40s Britain. 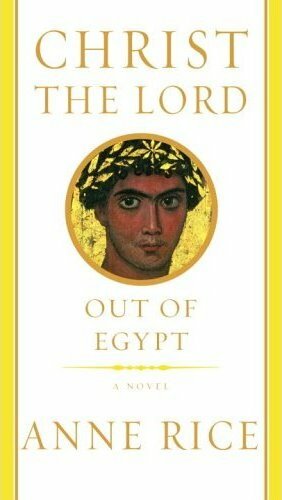 Yul Brynner stars as King Solomon, a role he took on after the untimely death of original star Tyronne Power who can still be seen in some of the distant shots. The story is based, of course, on 1 Kings 10:1-13, and so director King Vidor and his writer add plenty of padding to make those thirteen verses stretch for the 135 minutes run time. Solomon and Sheba was one of the first films to use Super Technirama 70. There's an interesting article at the Widescreen Museum discussing this and Disney's Sleeping Beauty. Donny Osmond takes the title role in this fairly terrible rendition of Andrew Lloyd-Webber and Tim Rice's musical. It's as tacky as you like even starring Joan Collins and Christopher Biggins to turn up the camp factor. Another documentary featuring Robert Beckford about the most talked about religious issue this year – that raised by the Da Vinci Code. It's somewhat sensationally advertised, but surely with a 2 hours runtime it will bring more balance than the book and the film, and hopefully it will reflect the scholarly consensus. Dirty Tricks magicans Barry and Stuart reproduce some of Jesus's miracles. Hardly new territory (magicians have claimed to be able to do various miracles for years), but if they manage to get killed and rise from the dead I'll be seriously impressed. Channel 4 are devoting an entire evening to the Pythons. The evening kicks off with this documentary looking at the controversy surrounding the film. I hope they show the complete footage of the TV debate between two of the Python's and a bishop and another religious representative. I don't think it will, but hopefully there will be some interesting footage that I've not seen before. A film that needs no introduction, but it is part of an evening on the Pythons. The evening continues after this film with the documentary "What the Pythons Did Next". There's so much religious-related TV this year that I can't discuss everything, so here are a few more programmes of lesser relevance. I'm fairly impressed with this list of programmes / films. Last year there was next to nothing. 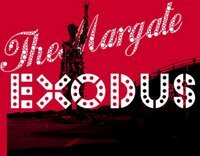 This time there are a number of interesting documentaries, a couple of Christian related films, and one proper golden-era biblical epic, albeit based on a story that would be unknown to many outside of the church and biblical studies departments. (It almost makes me wonder if it was a coincidence!). It's interesting to see Channel 4 leading the way as well. 10 years ago the majority of religious programming would have been on the BBC, but now their offerings are unimaginative low budget affairs whilst Channel 4 is producing new, engaging documentaries that should attract a far wider audience. It will be interesting to see how they do in terms of quality and ratings. A couple of my friends from the US have tipped me off that there is a documentary playing on the History Channel called The Passion: Religion and the Movies. 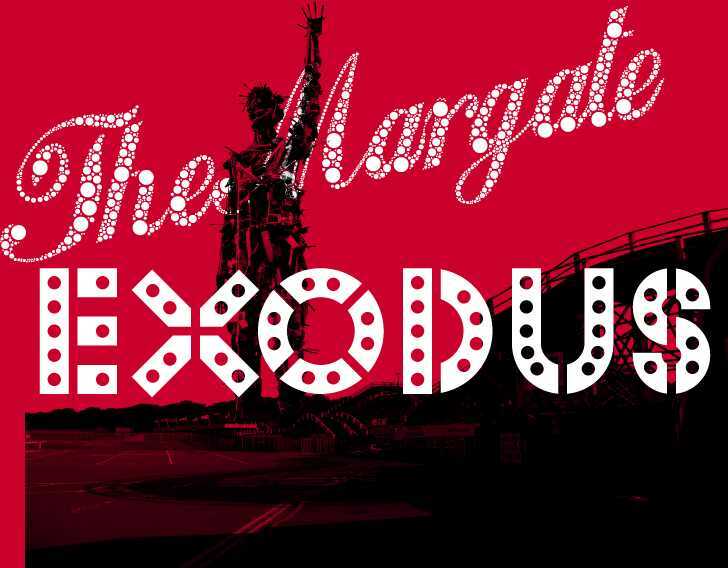 It turns out that it's a rebranding of the Channel 4 documentary I was involved in The Passion: Films, Faith and Fury. In addition to my main review of that documentary I posted a few other items about the film prior to its initial broadcast here, here and here (before I had seen it). There's a review of the US version of the film at Catholic Online. I understand it played twice on the 17th December, and is due to play again on the 2nd January (although I'm not entirely confident that that is still the case). Does anyone know who presented this documentary in the US version as these things often change as they cross the Atlantic? Over here it was presented by Birmingham University's Dr Robert Beckford. A warm welcome to anyone who has found me through this programme. 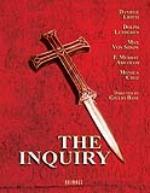 The Inquiry - The Revival of the Roman Christian Epic? 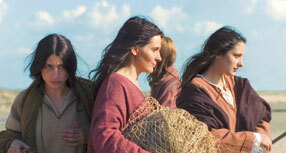 Yep, once again, I'm indebted to Peter Chattaway for highlighting a new bible related film. This time it's The Inquiry due to premiere at Capri Hollywood Film Festival in Italy, a couple of days after Christmas. The Enquiry will star Hristo Shopov, Max von Sydow, F. Murray Abraham, Dolph Lundgren, Ben Kingsley and Franco Nero. 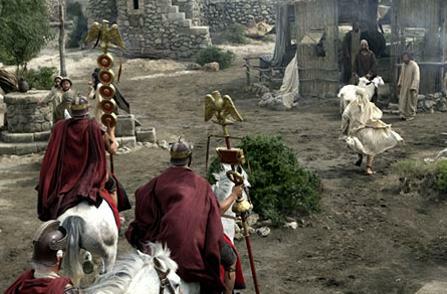 Story wise it seems to pick up the mantle of the Roman-Christian Epics such as The Robe, Quo Vadis, Barabbas and Ben Hur - a sub-genre that really has been quiet since the sixties. It will be interesting to see if there are any reviews of this film after Christmas. 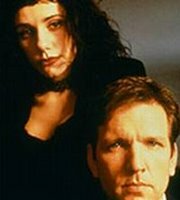 One of my favourite films about Jesus is Hal Hartley's 1998 film Book of Life. It's not really a film about the life of Jesus per se. so I could only include it in my top ten list of Jesus films as an honourable mention. But it does ask some interesting questions about Jesus, his relationship with God, eschatology, Christianity and so forth. Recently I found the Philosophical Films website, and it has the following brief review for the film and a series of questions. 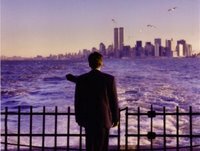 Jesus returns December 31, 1999 at JFK airport in New York City and checks into a Manhattan hotel. His task is to end the world as we currently know it, judge the wicked, and begin the new Millennium of God’s rule. To do this, he must open the last three seals of the Book of Life, which will bring on the remainder of the apocalypse. But, Jesus is having second thoughts and considering forgiving everyone instead. This means defying God and in essence exiling himself from God just as Satan did. As Jesus struggles with his decision, he locks horns with God’s attorney on earth who insists that Jesus follow God’s law. Meanwhile, Satan likes things just as they are and laments the opening of the Book of Life. When he discovers Jesus' hesitation, he acquires the Book of Life in an attempt to open just one more seal on it. Unfortunately for Satan, the Book of Life has a security lock on it that he can’t undo. "Those bastards in heaven, they think of everything," Satan whines. Satan then joins Jesus at his hotel for a New Year’s Eve party, and the new millennium begins just like any normal day. It's difficult in such a brief review to really do a film like this justice, although the 14 questions that follow deal effectively with many of the philosophical aspects of the film. It doesn't have that much to say about the astounding closing monologue which is done as a voiceover whilst the images switch from those of the New Year's Eve party to Jesus pondering these issues as he looks out to sea. The visual aspects of this film are very noticeable as well. The camera work is quirky, using different angles, blurs, slow motion etc. Elsewhere, the actors break the "fourth wall", and talk directly to the camera. Director Hal Hartley thoughtfully even provides a microphone to enable them to do this. So, as with other Hartley films, the film is as much about the formal aspects of filmmaking as it is about the philosophical issues the characters are raising. Whilst I'm at it, another brief review of this film appears in a summary of 1998's Vancouver International Film Festival at Canadian Christianity.com. I saw Rian Johnson’s Brick last night, and whilst it took me a while to get into, once in I was engrossed and have had ti going through my head all day. My brief review of the film is up at Open Heaven. The New York Times has a new piece on the forthcoming adaptation of Anne Rice's Christ the Lord. Although this was originally due to be out next year, things seem to be going fairly slowly at the moment. The script's first draft appears to have only been completed a couple of weeks ago. The article is actually more about the film's producer David Kirkpatrick, than Rice though. In particular is looks at his gradual conversion. As far as I'm aware there is no official website for this film as of yet. 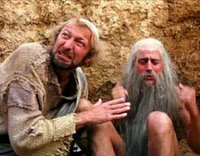 Obviously this film, at least when depicting biblical scenes is a harmonisation of the gospels of Luke and Matthew. There are a few limited references to the Protoevangelium of James (such as the names of Mary's parents), and a fair bit of Josephus (notably regarding Herod and his sons) but otherwise it's Matt and Luke all the way. At some point later, I plan to post a list of uncanny similarities between these two films, for now I'll simply note how the film omits a few key passages, in particular Jesus's presentation at the temple, and the prophecies about him by Simeon and Anna. We also don't see why the Magi return by a different route. It also omits both the birth of John, and the miraculous events surrounding his conception. It does however include the story of Jesus's trip to the temple. Speaking of which, one of the things we overhear Jesus say on this occasion are the words from Luke 12:22-28, (Consider the lilies/ravens). It's plausible I suppose that Jesus's great wisdom even at this point included some of the insights he would become famous for as an adult, but somehow the scene didn't ring true for me at least. I find it quite hard to believe this scene really happened as Luke has it. I'd certainly be quite keen to hear the literary/theological arguments for it's inclusion as the sole incident in almost 30 years of Jesus's life. There are a number of additions to the story. As mentioned above Josephus is used, in particular to flesh out the character of Herod. But there is a fair amount of fiction here as well. Joseph's life in Nazareth, his relationship with his cousins turned zealots and his involvement with Herod are all used to enhance the story. Interestingly, we also see Herod making a rash promise to Joseph in a manner reminiscent of his later promise to Herodias's daughter. We also get a good range of Joseph's dreams. Three of the four are included, with the common practice of combining the final two being used again here. In this film though we do not see an angel for any of the announcements and dreams. Joseph hears God speak in his own voice. It's an old technique of course, but having seen it used a couple of times recently, it makes me wonder whether you would really do some thing as radical (as it was then) as not divorcing your (apparently) unfaithful wife merely on the strength of hearing your own voice speak to you in a dream. Having only watched The Nativity Story once but having seen this once and dipped in and out of most scenes a couple of times, I'm actually more familiar with this film than The Nativity Story. I'm planning to watch that again soon though. 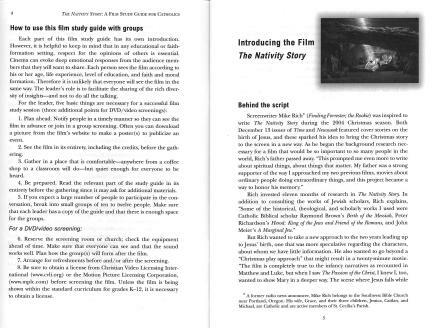 Book Review: "The Nativity Story", A Film Study Guide for Catholics. I wanted to look at some of the official resources for The Nativity Story. Since there is such an abundance of different books about the film, going back to even before it opened ten days ago, I obviously won't be able to discuss them all, but I thought I'd like to look at one or two in some detail. As I mentioned back in October, there are two resources for this film produced by Pauline Books and Media, written by Rose Pacette. Pacette has written a number of books on Faith and Film, including the three part "movie lectionary" series "Lights, Camera, Faith!" which she co-wrote with Peter Malone. She was also one of the advisors for The Nativity Story (her report on the film is available online). 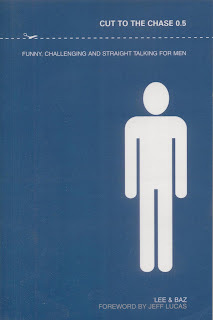 As the title "study guide" suggests the book is relatively short (28 pages), and divides into four sections. The first section is a general introduction to the film, sub-divided in two - one part introducing the study guide, and one introducing the film. Each of the remaining three sections forms a study guide for different settings - one for personal use, one for (small) group study, and one for a whole community. Each of these latter three sections is nicely tailored to suit the appropriate group, and the final section breaks down into sections for each of the significant dates over the Advent / Christmas period. For each dates there are questions for adults, teens and children. The book is unashamedly Catholic, even specifying in its subtitle that it is a "study guide for Catholics". That said, it's ecumenical enough to be very easy to adapt for individuals, groups and communities from other traditions. Whilst it mentions specifically Catholic things such as the Rosary, the Hail Mary, the Imaculate Conception and the Catechesis, they are largely incidental to the book's thrust, and could easily be passed over if so desired. Furthermore, non-Catholic groups may benefit from some of the explanation around the more Marian aspects included here. I personally found the perspective on the Hail Mary quite informative. At 28 pages, the book feels about the right length for most church-goers who aren't specialists in film. It doesn't introduce a lot of technical film words and phrases, and provides a good basis in theory for using film to deepen understanding. It also benefits from being written by someone who has had such close access to the film during production. In particular, Pacette has obviously had the time to fully contemplate the film and weigh its various strengths without having to rush that part of the process(critical for a work such as this) in order to meet a deadline. Whilst this study guide is ideally suited to Roman Catholics, it is a useful tool for anyone that wants to use The Nativity Story as a way of thinking deeply about the events of the first Christmas. I just got emailed this nicely put together animated film of the Nativity made from Lego. Amazingly this is the product of a 16 hour project by a ten year old with his Dad but it's nicely animated, and actually pretty funny. They also seem to have made a behind the scenes animation to accompany the end credits, which looks like it took at least as long as the film. If you don't have time to watch The Nativity Story this Christmas, then you should at least spend 5 minutes watching this. 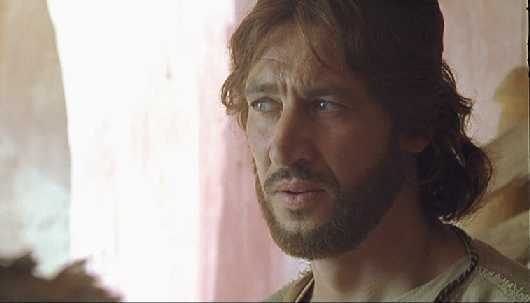 On Friday I posted about one, or is it two, film(s) about Jesus written from the perspective of the Koran. By accident I missed off the link for a website which seemed to belong to one of them (or was it a third film). So I went back today to try and correct the error. Yet strangely, over the weekend, the site seems to have disappeared. It's still available on Google cache (where would we be without Google cache? ), but otherwise it seems to have gone without trace. I can't help the darker side of my imagination running away with this one. An unlikely friendship between a young Muslim child and an aging Catholic priest forms the basis for this touching story. Moshen Falsafin plays a little boy whose mother died in childbirth. A good student who works hard to help his father, he is troubled by one thought -- he does not know what his mother looked like. When the boy meets a priest (Rafik Dergabrilian) and expresses his concern, the cleric suggests the boy imagine his mother looked like his portrait of the Virgin Mary. Pesareh Maryam/Son Of Mary was the directorial debut of noted Iranian actor Hamid Jebeli. I've received two pieces of news in the last 24 hours about a film being made about Jesus based on the Qu'ranic accounts of his life. Last month, I discussed Iranian film St. Mary which looks at the story of Jesus's mother from the Koran. I received a comment on that post from Ali who says "Soon to be released is the Farsi movie, The Messiah, a movie about the life of Jesus Christ (according to the Qur'an)". He indicates that it's being distributed by the Jafria Association of North America. From what I can work out the website from this film might be this one. The Iranian director Hamid Jebelli is showing the life Jesus from the view-point of the Koran. 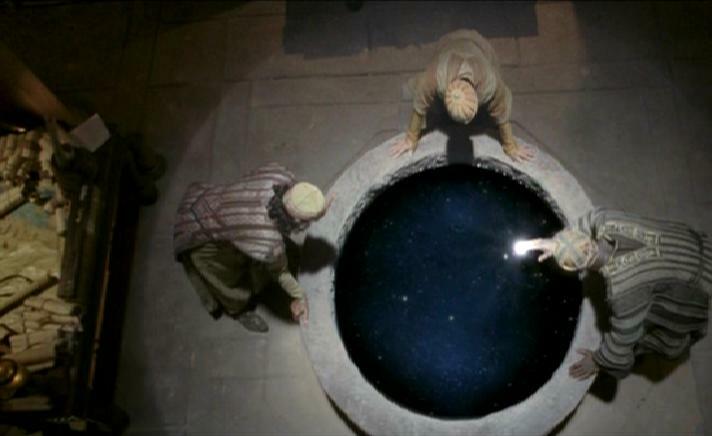 The Iranian film about Jesus Christ is one of the high points of the Mirror-Image-Ritual Film Festivals "Tertio Millennio", which takes place at present in Rome. Director of the Iranian film "The Son of Mary" is Hamid Jebelli, a Muslim. The film represents the Koranic view of the history of Jesus. The festival is organized by the magazine "Rivista del Cinematografo" together with the Italian catholic play combination. The director/conductor of the festival, Andrea Piersanti stressed, it is a matter of hearing the "voice of the spirit in the film production of the present". There are a couple things to add to this. Firstly, it's unclear whether these are two different films or not. Certainly it seems quite a coincidence that two films about Jesus based on the Koran have come to the fore at the same time. But then the titles are different, although obviously that often is the case when films are translated into different languages. Secondly, I wonder how these movies/this movie will film Jesus. As an Islamic prophet I'd imagine he is unlikely to appear on screen, or has this film decided to ignore that? If not will it film the story through his eyes like The Message, or Lance Tracy's The Cross (which it would appear is now available on DVD)? As promised earlier in the week here is my scene guide for The Nativity Story (my review). This might contain some spoilers, though obviously the story is pretty well known. You can read all my posts on the film at this link. This is obviously a harmonised version of the two birth narratives from the gospels of Matthew and Luke. Most of the text from the gospel birth narratives are included here, and, as Mark Goodacre points out, the omissions are generally justified in order to combine the two different versions into a single, smoothly flowing narrative. The main omissions are the full text of the Magnificat, Zechariah's prayer, a host of angels appearing to the shepherds, Jesus's presentation in the temple, and the magi's dream is replaced by them deciding for themselves that visiting Herod might not be the best plan. Only one of these items is really an episode - that of the temple appearance, and as Mark points out this has to be sacrificed in order to get the shepherds and the wise men there at the same time. Personally, I wish they had included this scene as I find it quite inspiring, and had decided not to have the shepherds and wise men arrive together. That is not supported by either text, and the contrast between stable (Luke) and house (Matt) and Herod's decision to kill all males in Bethlehem under the age of 2 (having learned when the star first appeared) suggest to me that if the gospel accounts are to be harmonised then the wise men should arrive some time later. Steven D Greydanus of Decent Films notes in his review how the film seems to chop the inspiring and beloved words of the Magnificat and Zechariah's prayer. He notes how "these omissions are all the more curious precisely because the whole challenge with these scenes is the paucity of source material". I can see both sides on this one, particular as I found the added dialogue quite poor in places. But I have also seen various people try and act out the words from the Magnificat and it is always poorly executed, and feels very forced and static. Two omissions that neither Steven nor Mark mention relate to the effect that these two miraculous births had on those who witnessed them. Following the birth of John Luke 1:65 notes how " All their neighbours were filled with awe and the whole affair was talked about throughout the hill country of Judaea". Likewise, once the shepherds have seen Jesus Luke records how "when they had seen him, they spread the word concerning what had been told them about this child". This emphasis on not just hearing the news about what God was doing, but telling is others is something of a Lucan theme, and leaving it out does, to a degree, make it easier to relegate the story to "just a story". These verses are nearly always omitted from filmed versions of the nativity stories. I'd love to see them covered one day. 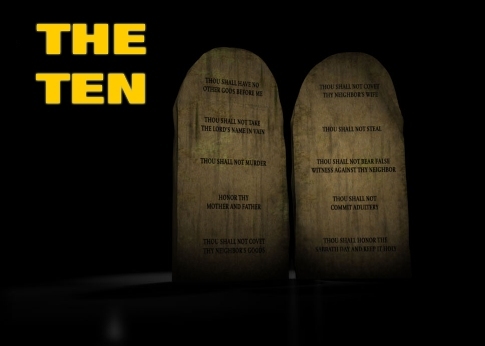 As with the source material, there are a few Old Testament verses used as well. As I noted in my review the account of Elijah hearing God's after the earthquake wind and fire is referred to twice. There is also the opening quotation from Jeremiah 23:5-6, something that sounds like it might be based on Zech 9:9, and some quotation from Joseph''s dream that I missed completely, but I think is probably Is 7:14. That's one to check next time I see this. I have a few more points to make about this film before I'm done, but I'll save those for future posts. 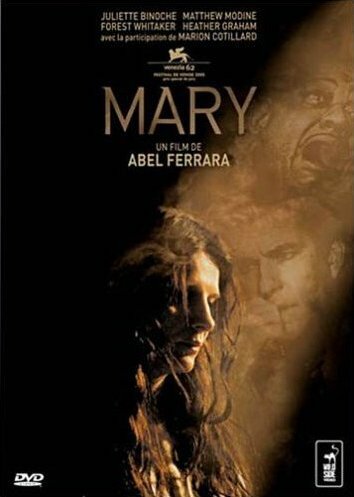 Having reviewed Abel Ferrara's Mary last month I'm now posting a scene analysis, of sorts. I say "of sorts", because, as I noted in my review the film does not really have much to do with the New Testament per se. 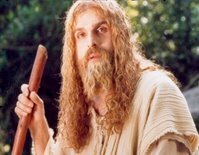 as the fictional Jesus movie that the film is about seems to be as much derived from the non-canonical Gospel of Mary, as the New Testament. Instead of giving a list of biblical and extra-biblical scenes as normal, instead I'm going to describe various scenes, with particular emphasis on the scene's involving the actress who plays Mary Magdalene in the fictional movie Marie Palese (Juliette Binoche). Naturally this post contains spoilers galore. I should perhaps give a brief intro to the film (although read my review for more detail). Tony Childress (Matthew Modine) is a film producer who is making a controversial movie about Jesus, based in part on the Gospel of Mary. Mary is played by an actress called Marie Palese (Juliette Binoche) who has a religious experience as a result of filming the movie and moves to the Holy Land. 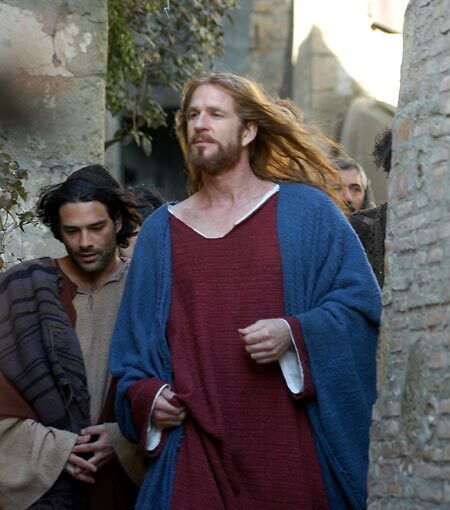 But the film really revolves around Ted Younger, a TV presenter whose programme looks at various controversies surrounding the life of Christ. [6 mins]- The movie wraps and we see Younger's show and meet his wife. "How shall we go to the Gentiles and preach the Gospel of the Kingdom of the Son of Man? If even he was not spared, how shall we be spared?" "Sister, we know that the Savior loved you more than other women [cf. John 11:5, Luke 10:38-42]. Tell us the words of the Savior which you have in mind since you know them; and we do not, nor have we heard of them." "What is hidden from you I will impart to you." And she began to say the following words to them. 'Blessed are you, since you did not waver at the sight of me. For where the mind is, there is your countenance' [cf. Matt. 6:21]. "Say what you think concerning what she said. For I do not believe that the Savior said this. For certainly these teachings are of other ideas." "Did he then speak secretly with a woman [cf. John 4:27], in preference to us, and not openly? Are we to turn back and all listen to her? Did he prefer her to us?" "My brother Peter, what do you think? Do you think that I thought this up myself in my heart or that I am lying concerning the Savior?" "Peter, you are always irate. Now I see that you are contending against the woman like the adversaries. But if the Savior made her worthy, who are you to reject her? [20 mins]Younger arranges an interview with Childress. Followed by a behind the scenes shot of the movie. The whole sequence has a dreamy feel to it. MP:It takes courage to walk in the truth, and it takes courage to become fully human. 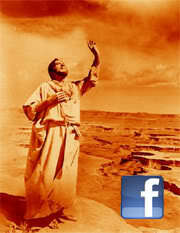 Jesus helped Mary Magdalene, and (s)he’s helping me now. [46 mins] - Younger discovers blood. His wife's prematurely in labour. MP:Do you love your baby? MP:As his father would you do everything in your power for him? MP:Do you think the father, your father would do the same for you? TY:Oh well if he loves me so much then why is he doing this to me? MP:Have you asked him? Have you spoken to him? TY:I can’t speak to God. Because they will persecute you as they have persecuted me. The hour has come when you will be put out the synagogues, indeed, the hour has come when those who kill you will think that by doing so they are offering worship to God. I’ve said these things before they occur, so when they do occur you may remember that I spoke of them and you may believe. TC: What you doing now? Healing lepers? [67 mins] - Jesus washing the disciples’ feet - (John 13)[70 mins] - Younger's prayer. "You are blessed when the sight of me does not disturb you. There lies the mind lies the treasure." "Where do you come from, murderer, and where are you going, wanderer?...My craving has faded, and I am freed from my ignorance...I left the world with the help of another world...The design was erased by virtue of a higher design. Henceforth I travel toward repose(?)" [79 mins] - Palese returns to shore still in biblical dress. Further to my post questioning the relationship between Marie Palese and Mary Magdalene I noticed in fast forwarding through recently the parenthesis provided by the two scenes of Mary by the shore of the sea (presumably of Galilee. In the first shot her companions are going out to sea, in the final one, they are returning from their voyage. (I also noticed a couple of fleeting shots of her in a storm at sea when Childress is projecting the movie after the aborted premiere. It's unclear here whether this is footage of the film, or, again, in his head. Certainly the way Palese directly addresses the camera would be unlikely for such a movie). 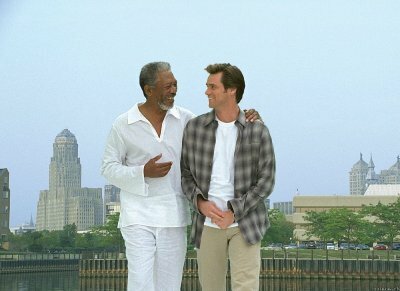 Given that the first and last shots surround the scenes where Ted prays for forgiveness and the healing of his family, ultimately leading to his confession to his wife and their reconciliation, (not to mention an epiphany of sorts for Childress) it would appear that there is something of a "fishers of men" motif being indicated here. Some people have noted that the extant text of the Gospel of Mary never actually stipulates that the Mary it refers to is Mary Magdalene. There are of course up to six different Mary's mentioned in the New Testament, and this could possibly refer to any of them. That said it seems hard to imagine that many of them would have such prominence other than Mary Magdalene, and Mary Jesus's mother. In any case this argument mainly seems to be employed to permit people to ignore the text without taking it seriously. I'm still unclear what this film is saying about Mel Gibson and The Passion of the Christ. On the one hand it would appear to side with the maker of a controversial Jesus film and support Gibson's right to free speech, but on the other Childress is so arrogant and unsympathetic that one can't help but wonder if that is intended as a reflection on Gibson too. 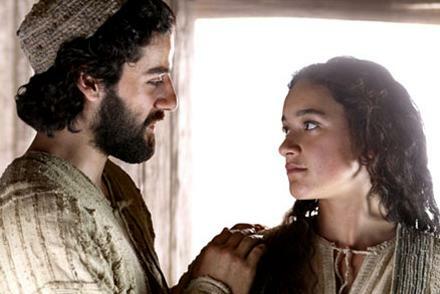 Furthermore the film seems to have strong sympathies regarding the Gospel of Mary, not only bringing it to greater prominence, but also giving a platform to one of its most vociferous champion, Elaine Pagels, and indicating the faith that the work might inspire. But it does so, by showing how the established church has suppressed the work, another thing that appears contrary to Gibson. Perhaps Ferrara is simply taking the line of disagreeing with what Gibson does, but defending his right to do it. This year, though, saw the super-wide launch of The Nativity Story, but the birth of Christ proved far less popular than the death of Christ. The Nativity Story bore an estimated $8 million at 3,183 theaters, crumbs compared to The Passion of Christ's $83.8 million not that it was ever expected to replicate that unique phenomenon. 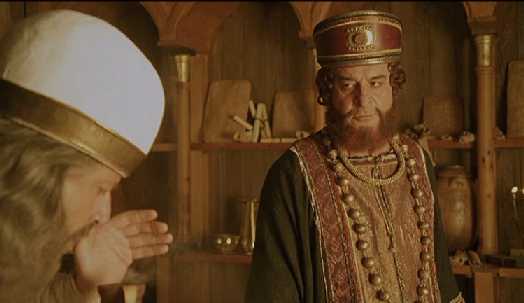 New Line Cinema's $35 million re-telling of the Biblical yarn, positioned for the Christmas holiday like The Passion was for Lent and Easter, was Hollywood's first explicitly Christian movie to come in the wake of The Passion, but performed more in line with the independent Christian pictures, like One Night with the King. Against a raft of Nativity displays and festive secular Christmas fare, The Nativity Story lacked the oomph to be a theatrical must. I do think that this one will do a bit better as Christmas draws nearer. In many ways, it feels too early to watch a film about the Nativity just yet. My suspicion is that the marketing strategy is to get a few people to see this film early and hope that they will spread the word to others so as to get bigger audiences as Christmas draws nearer. There are a few other pieces I'd like to mention. Over at NT Gateway, Mark Goodacre posts his initial thoughts, as does Mark Roberts. The Guardian has a nice preview piece by Hannah Patterson. There are also stacks of interviews with a number of the major players. I don't have time to list them all, but thankfully, Queen Spoo is a great deal more on the ball than I am. 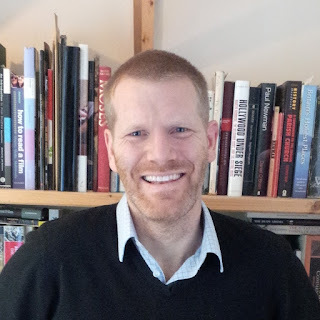 Peter Chattaway (who has now collected his all his posts on this film together) has got a number of articles up, Mary in the Movies for Christianity Today, plus previews at Christian News, and ChristianWeek, plus of course his review as noted above. He has also posted additional excerpts from his various interviews with Oscar Isaac (Joseph), Shohreh Aghdashloo (Elizabeth and director Catherine Hardwicke. Speaking of Hardwicke, CT's Mark Moring has also interviewed her. In other Nativity News Queen Spoo has various new video bits including footage from the premiere (as well as an audio file and PowerPoint), and a behind the scenes promotional video. 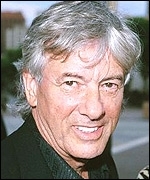 Stories about Paul Verhoeven (director of Robocop and Total Recall) and his desire to make a film about Jesus go so far back that I am not particularly optimistic this project will ever see the light of day. I first heard about it in the first edition of W. Barnes Tatums' "Jesus at the Movies" which was published almost ten years ago in 1997. However, Tyler Williams highlights an interview with Verhoeven at Empire. It seems he fears getting attacked by fundamentalists so much that he's decided to write a book on it first. There are a few points about this. Firstly, it seems unlikely anyone would actually shoot him (as his scriptwriter has actually told him). Secondly, if people are going to be offended by a film they probably will be by a book. Presumably he has never heard of the fatwa slapped on Salman Rushdie. No sooner had Mel Gibson’s The Passion of the Christ had its massive opening weekend, than it became inevitable that biblical epics would soon be back on our screens. Hollywood may not be religious as it once was, but it can still smell a buck. So, hot on the heels of the critical acclaim for the independently released Mary (by Abel Ferrara), and Mark Dornford-May’s Jezile (Son of Man) comes New Line’s The Nativity Story. The Nativity Story is actually the first bible film produced by a major Hollywood studio since Richard Gere donned a dodgy wig for King David 20 years ago. Eager to avoid the box office failure of that film, New Line have been pretty canny in their choice. In Mike Rich, they have a writer whose mainstream Christianity will be popular with US evangelicals, and in Catherine Hardwicke they have a director with such critical acclaim for her previous work that even the most ardent Christian-sceptic film critics have been prepared to suspend judgement. The film's one marketing glitch is that it is far less controversial than The Passion potentially losing hours of free publicity as a result. A few uninspired journalists have tried to whip up a bit of controversy over lead actress Keisha Castle-Hughes' unexpected pregnancy, but otherwise there is not much to report. The story of the nativity is one that it is so well known, and so central to western culture, that it is hard to believe that so few films have been made about it. Just one theatrically released, English language, feature film has been made about Jesus' birth since 1914. True, a few films have used it as a prologue to the adult life of Jesus, but its comparative absence amongst the super-abundance of Christmas films is staggering. Yet despite its uniqueness, it can't quite decide what kind of bible film it wants to be. The title suggests a mythic retelling, perhaps aimed at the family, yet the early scenes have a gritty, realistic feel to them. Later on though the film morphs into a sort of road movie as Mary and Joseph get acquainted and start to appreciate one another. Then it changes gear yet again once the holy couple reaches Bethlehem. The last remaining vestiges of realism are swiftly ditched and out comes a touch of the Christmas magic. The light from the star shines through a hole in the roof and makes the coldest and dampest of caves seem warm and lovely. Finally, the film ends with the new family fleeing from Herod, ending the film as if it's the close of part 1 of an action trilogy. It's not that there is anything particularly wrong with any of these different styles; it just leads to a very uneven film. It would have been far better to choose one style and stick with it throughout. For me, it's the gritty realistic style that the movie opens with that serves the film best. Catherine Hardwicke has made a name for herself both as a production designer and as a director of realistic films about teenagers from poor families. Here both talents blend together marvellously in the opening scenes. Nazareth is recreated more believably here than in any other Jesus film to date, save possibly Pier Paolo Pasolini's Il Vangelo Secondo Matteo. Arguably late-twentieth-century scholarship's greatest contribution to our understanding of Jesus is the additional insights it has given us into the peasant world that Jesus was born into. 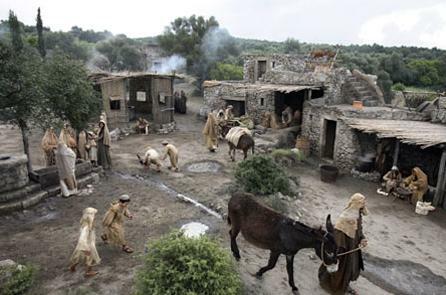 Writers, such as John Dominic Crossan, have emphasised how ordinary people in first century Galilee existed barely a whisker above poverty and destitution. The first half-hour of this movie captures this brilliantly. As the camera weaves between the crumbling dwellings it takes in the dirt of peasant life. It's a world where people sell on their small surpluses to neighbours, and are nearly always working at one small task or another, children as well as adults. Where pre-mature tax collection or failed harvests mean catastrophe. The fields are not full of post-agricultural revolution golden grain, but straggling plants seeking to work their way out of the mud. It's easy to see that this world would incubate a revolutionist dream, a fact underlined by the failed, crucified zealots that are shockingly encountered, not as something extraordinary, but just as part of every day life. Yet the film not only emphasises the hopes for a military messiah, but also indicates that this is not the way God works. Twice 1 Kings 19:11 is recited as people recall how Elijah hears God not in the wind, fire and earthquake but in the still small voice. 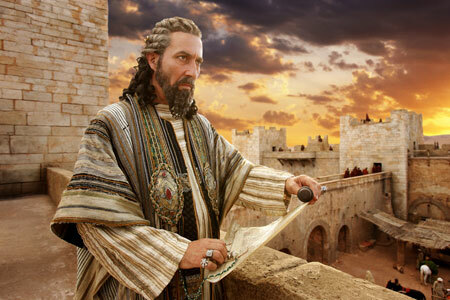 Jesus would come from small and humble beginnings not Herod's grand and imposing palace. Herod's fear of a king not of his line is nicely portrayed by Ciarin Hinds who has managed to play both Herod and Caesar within the space of a year or two. He is one of four fathers in the film, all of which are performed very well. Stanley Townsend as Zechariah creates one of the film's most touching scenes despite being mute for the majority of his screen time. As Mary's father, Shaun Toub, encapsulates the toll his way of life takes. There's a heaviness to his every move, and his drawn face speaks of a life that has felt long and hard. Toub is one of a number of non-white members of the cast, another factor which adds to the authenticity of the film. Keisha Castle Hughes is Maori, Shoreh Agadashoo, who plays Elizabeth is Iranian, Hiam Abbas (Mary's mother Anna) was actually born in Nazareth, whilst Oscar Isaac (Joseph) has his roots in Guatemala. As the fourth father, Isaac's performance is probably the best of the lot. 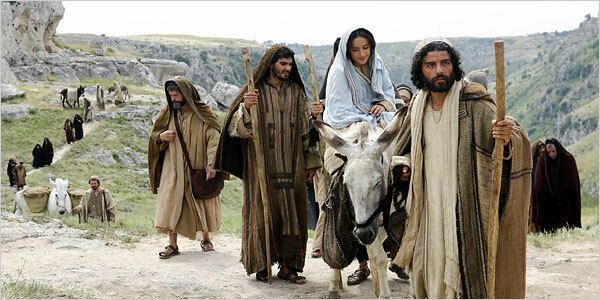 Whilst the screenplay harmonises the emphasis on Joseph from Matthew's gospel, with the emphasis on Mary from Luke, the film is marginally more concerned with her story than his. Yet Isaac's performance makes Joseph the most interesting and compelling character. This becomes his story and his journey. It's often been noted how difficult it is to portray good characters in an interesting manner, and Isaac has only the single personality trait, "righteous", to go by. Yet he manages to not only embody this characteristic at the start of the film, but also to improve upon it as the picture progresses. Whilst his evident desire for the teenage Mary is initially uncomfortable for us, there is never any suggestion that it is untoward. One of the best scenes in the film is when he has a dream about stoning Mary only to be prevented from doing so by an angel. But the writing often fails to live up to this scene's promise. All too often the dialogue seems forced, awkward or clunky. The use of middle eastern accents works in many ways but only serves to highlight the weaknesses in the script. Elsewhere it labours to present unnecessary, overly earnest factual background information, taking the viewer right out of the narrative flow with such passages far more suited to an educational movie. Would a star gazing magi really talk to his colleague about the planet that "the Romans call Jupiter" as if it was the first time they had discussed it? Similarly, Joseph's description of a shepherd's lifestyle is all very interesting, but he may as well have directly addressed the camera as painfully try to pass it off as the kind of thing one would actually say to the daughter of a goat owner just before she gives birth? It's also highly debatable whether substituting the three stooges for the magi really works. It gives the film more of that Twenty First century Christmas schmaltz and undoes so much of the good work in making the film realistic. There are moments of genuine humour, but it detracts from the flow of the film, rather than enhances it. All of which is a shame, because overall the film is more good than bad, just. Sadly the film betrays the fact that it was a rush-job. Keen to cash in on The Passion of the Christ, New Line forced this project through within a year of writer Mike Rich sitting down to start the screenplay. It's a shame that they didn't give the film another year in order to re-work its bad parts, build on the good and create a film truly worthy of the subject matter.